Re-introducing Bishop's Castle & Clun chairs made in the old, traditional way from green ash. Stuart and Jane Carroll have been making chairs at Old Time for about eight years and have customers from around the country. 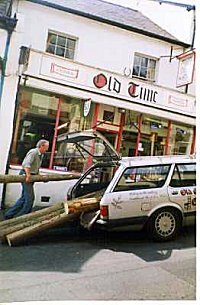 Ash trees grow well on the hills of South Shropshire giving us an easy supply of logs for cleaving and turning and planks for seats. Local ash logs for chair making in the yard at the rear of the house. They come at present from local woodland to the south of Bishop's Castle. 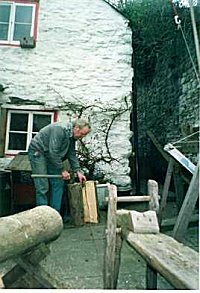 The logs are sawn to size and cleft in the yard releasing the stress in the wood and beginning the process. 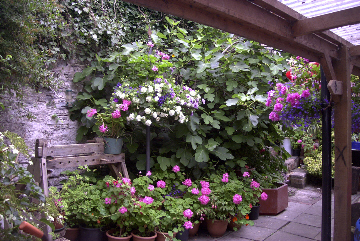 We are members of the Bishop's Castle and Clun Valley Real Furniture & Craft Group - an association of local makers of fine quality furniture. Bishop's Castle humped ladder back chairs at the end of the process. Stuart bringing tree trunks in (left) and cleaving ash logs in the yard. 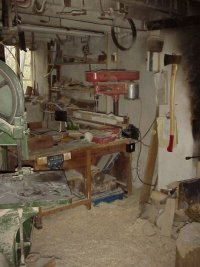 The workshop is in the background and in the foreground can be seen a shaving horse, an old tool still used for taking the edges off the cleft pieces to prepare them for turning. The cleft pieces are turned into chair parts in the workshop off the yard. 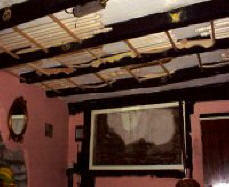 The legs and stretchers are racked to dry in the rafters of the 15th century house. As they "season", they oval but do not warp or twist as saw milled wood frequently does. Because cleaving follows the grain of the wood, the chair pieces are very strong. chair parts in the rafters of the house. Cleft wood is also cut and sticked to make ladders and skirts for the chairs. The only seasoned wood bought, is the local ash planks to make the traditional chair seats. We always try to use whole planks for the seats. Once dry, the pieces are drilled in the workshop and the chairs are made. and staining in the finishing room. 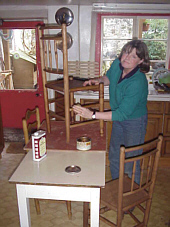 Jane in the kitchen at Old Time giving a final polish to a Clun chair. This pair of small, walnut stained Clun chairs were for a customer in Clun! The chairs are then taken apart for staining. This process takes part in the finishing room to the rear of the high street shop. Chairs are then finally assembled. They are waxed with a heavy beeswax polish we make ourselves and polished. Our chairs generally have two or more coats of wax before they leave us. We advise our customers to nourish the wood well with a good quality beeswax based polish. The waiting time for chairs varies from six to 12 months and we do our best to fit in single chairs being made for special occasions - birthdays, christenings etc. All chairs are numbered on the seat bottom and signed. They can have initials and dates stamped. Click here to return to our home page and find out about OLD TIME BED AND BREAKFAST and OLD TIME FURNITURE.